This year marked the 20th anniversary of the Molokai 2 Oahu race. 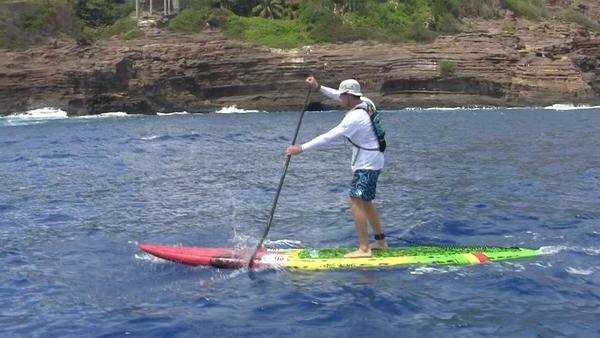 Kai Lenny, the fastest solo paddler, set a new SUP solo record, finishing in 4:07. The evening before the race I saw Marcus Tandrew making adjustments to the Deep Oceanboards dug out unlimited board he designed for James Casey. I talked to them about the design and the results speak for themselves, the three riders using Marcus's boards finished 4th (James Casey), 5th (Toby Cracknell) and 7th (Matt Nottage) overall in the Men's Unlimited solo division. My good friend, training partner and coach Jeff Chang did the race solo on a prone board this year. Jeff is an amazing waterman and great person all-round. He designed and built the board he used in the race and only finished it a few days before the race. He finished the race in 6:42, and came in 3rd place in the "50 to dead" division, a great result for his first time on a prone board! I did the race solo on in the 14' SUP stock division and was a bit disappointed with by performance. I showed up at the start a bit jet lagged and with a stuffy nose after getting back from a family trip two days before the race. I forgot to put the batteries in the GPS way pointer I had mounted to my board and went too far north when Oahu disappeared in the clouds. Then I got stuck in sticky waters outside of Makapuu and started running out of steam, I really slowed down. Sill, I finished the race in 6:15 and it felt great to complete another solo crossing. Once again, the 14' Bump Rider proved itself as a great channel board, with great finishes by many paddlers, I'm stoked to have so many great paddlers using this model. Glad to be done with another solo crossing.